Happy Friday, Friends! I hope you have had a good week. I have been wanting to share with you a couple of quilts before the year ends. 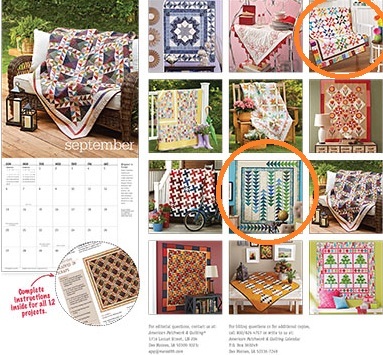 The first quilt is Migration, and it is featured in American Patchwork & Quilting’s 2015 calendar. Migration is a little different from my usual style. It is a geometry-centric design that focuses on the use of flying geese units in different color gradients to achieve a captivating (I hope) visual effect. I had the GREATEST fun making the quilt, and I felt I was rather hip after completing the project. Migration uses fabrics from Island Batik — check out Island Batik’s website here for similar fabric swatches that can be used to replicate the quilt. Actually I would really love to hear what other color combinations you have in mind! I am thinking a fiery yellow and orange and red combination would make a very stunning visual impact. 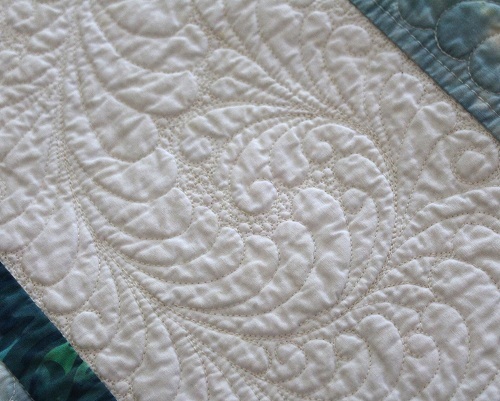 The quilt design lends itself to much negative space for quilting. The following picture partially shows the back where I had quilted circles randomly across the quilt, and then filled in with feathers. 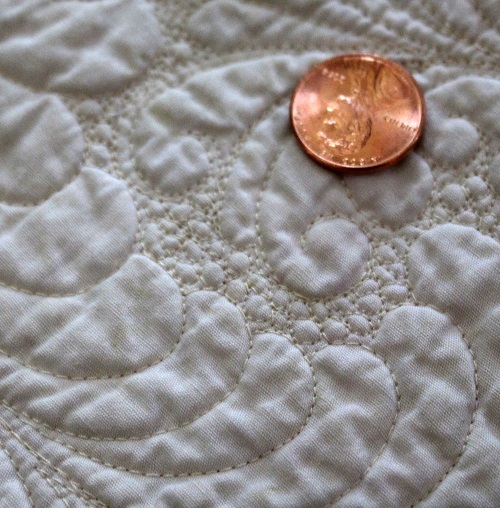 Here are a few close up pictures of the quilting on the quilt front. I know I sound like a broken record, but I honestly don’t think I will enjoy the quilting process as much as I do if it weren’t for the Aurifil Mako 50 Cotton threads I am using. I included the following shot to show just how tiny and tight Aurifil’s Mako 50 Cotton thread allows me to quilt in the background fillers in the picture above. 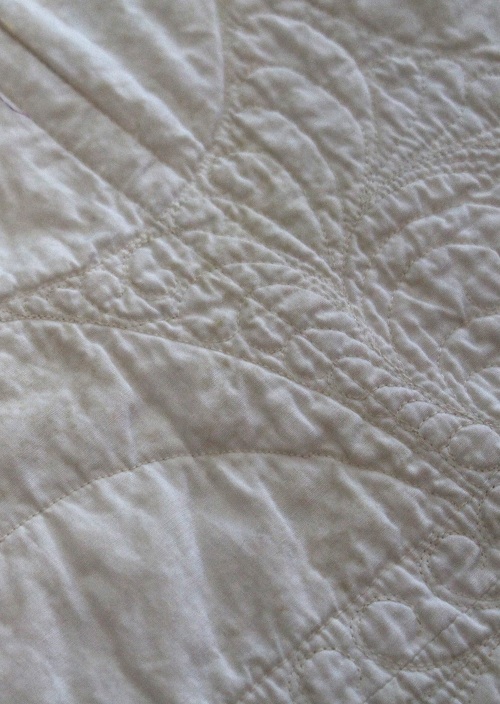 I wanted my quilt to lay flat and not stiff as cardboard after all the dense quilting. So I opted to use Hobbs Tuscany Silk batting as the “meat” of my quilt. I also made a hanging sleeve for this quilt because I know for sure I want to hang this quilt up somewhere. Want to make Migration? 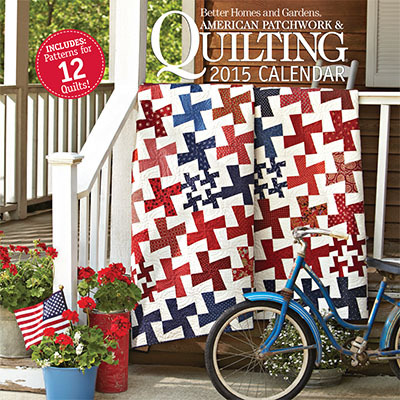 American Patchwork & Quilting Calendar comes with a separate booklet with complete instructions for all 12 projects. You may purchase the calendar here. The calendar and booklet would be great for anyone who wants to do a QOM (Quilt of the Month) regimen. I actually have two projects featured in the calendar. I will be sharing about the other project next week. So do come back! 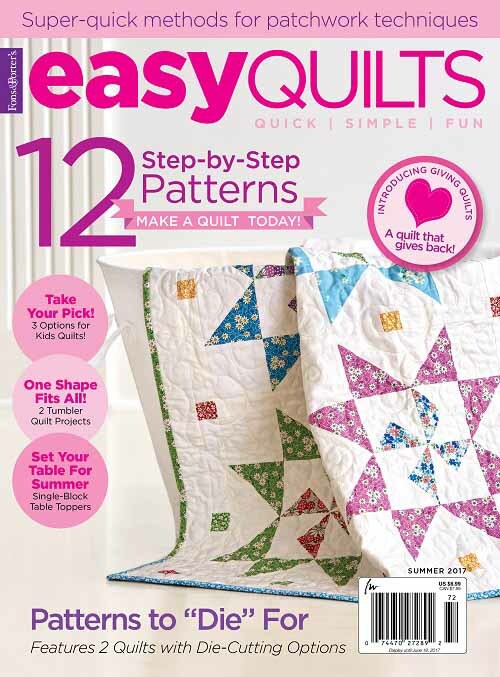 :) It is that star quilt on the top right corner — and you know what I think of star quilts! Tell me what you think of Migration. And this rounds out a very intense week for me! I intend to work still, but will take things a bit more slowly. Have a blessed weekend, Dear Friends! My 2014 lineup to date — click on project names for more information on individual projects. 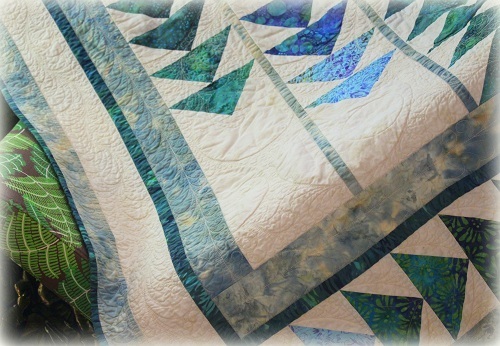 This entry was posted in Quilt Pattern, Quilting, Quilts & Projects: Published and tagged American Patchwork & Quilting Calendar 2015, Aurifil, Feather quilting, Flying Geese Quilt, Hobbs Tuscany Silk Batting, Island Batik, Wendy Sheppard Designs. Bookmark the permalink. You are incredibly talented and generous. Thank you for all the inspiration and direction this year. May God bless you and your family this Christmas and best wishes for 2015. This is a beautiful quilt, Wendy. Your fine work is just so lovely. I love the star quilt too. This is a great calendar. Now I want it. I know you are having a wonderful time preparing for Christmas. Your email updates are always so inspiring and just exquisite! Congratulations! Your quilts are beautiful. Tea Sew to make someone happy! 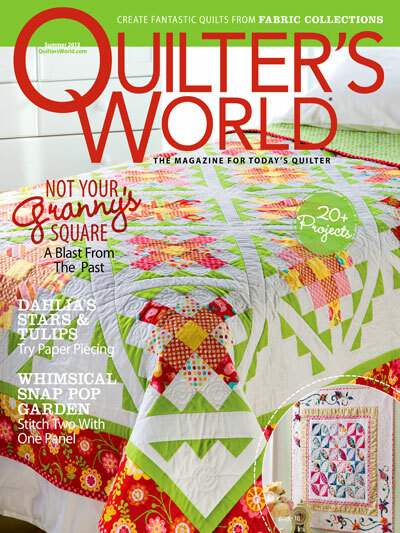 Love the quilt, I agree a fiery yellow, orange red would be really striking. If you can’t find a spot in your house I could find one in mine for sure Lol. 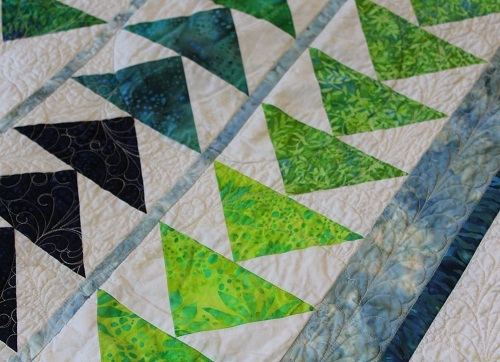 While this quilt is beautiful, I’m looking forward to the post showing the star quilt! But I have a question for you and any of your readers. Does anyone notice an odor when they work with silk batting? I do and was a little surprised. As a knitter, I noticed the odor when I knit a 100% silk shawl. When I researched it I found that some people notice an aroma, while others don’t. 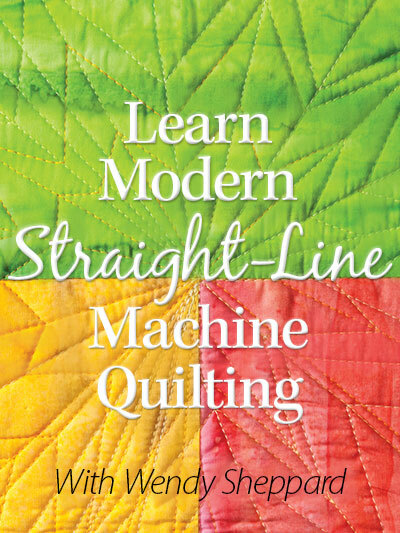 I loved quilting with silk, but it’s taken awhile for that aroma to fade. (((hugs))) Wendy, hope your schedule has slowed down, so you can enjoy this wonderful holiday season! Migration is a beauty. Think that I am more of a traditionalist, but then, maybe flying geese are of the traditional mode…hmmmm. 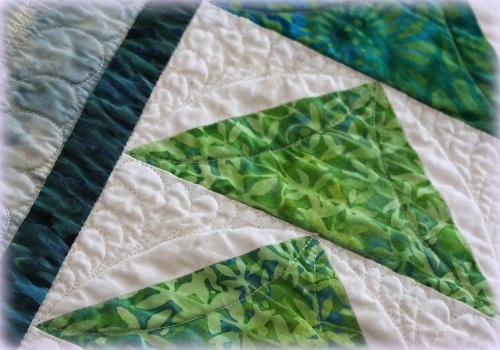 The quilting is awesome as always!!! I have an extra wall in my home. Enjoy your “slowdown”. Have a lovely weekend. That’s gorgeous. 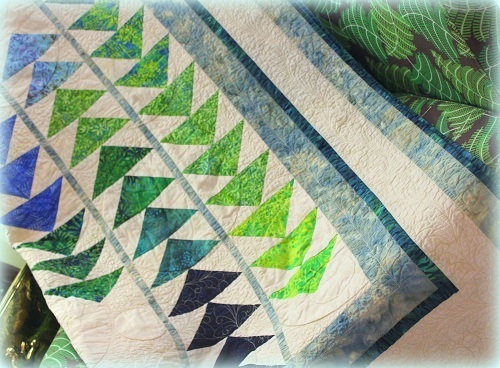 The gradations of color are so pretty, and the quilting is outstanding. I need to find this calendar. Thanks! It looks wonderful, Wendy. I love the fabrics you used in it. 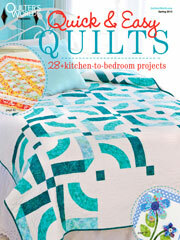 I also say a couple of your projects in my most recent Love of Quilting magazine. You have been busy! I love migration. 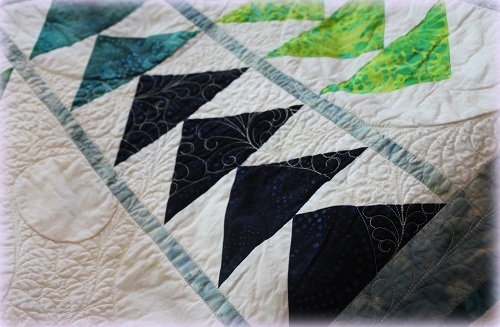 Flying geese are always a favorite and I love the colors you chose. I could also see it in shades of pink and orange. Does your husband ever see you? I know mine comes and threatens to turn off the electricity at bedtime! By the way, those flying geese are gorgeous. I really like the soothing colors in this one. Nicely done. This too is another beautiful quilt. I’m beginning to think that the ONLY kind of quilt you make…lol. 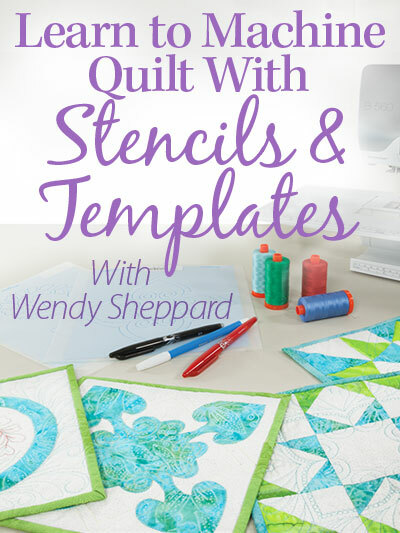 The design is so simple, the color choices are so crisp and clean, but it’s your magnificent quilting that takes the quilt to that high level of beauty. I’ve been making quilts for a long time—my piecing and design skills are fine—-but it’s that “how do I quilt this” that gets me every time. 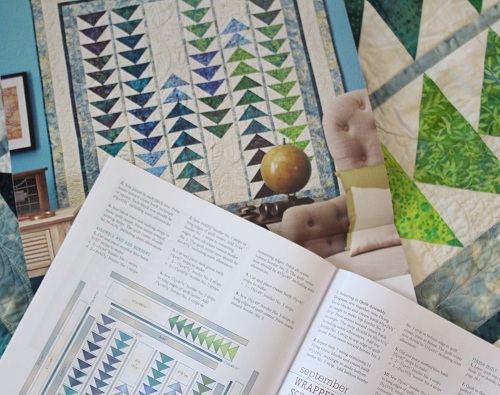 One of my favorite parts of your blog is “Thread Talk”….Do you think you might address your design process for the actual quilting in an upcoming post? Do you doodle designs first? Do you audition designs? 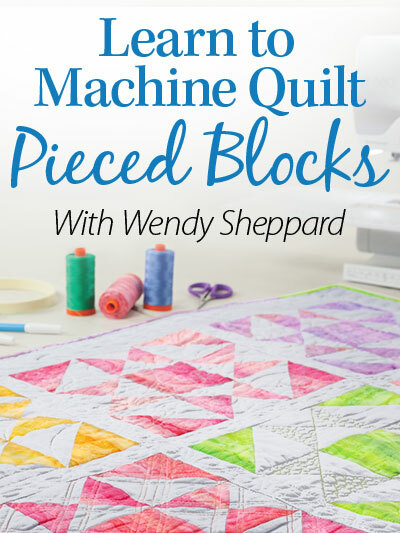 I have a vision of you just sitting down at your machine and whipping out these breathtaking designs from start to finish. Blessings…. 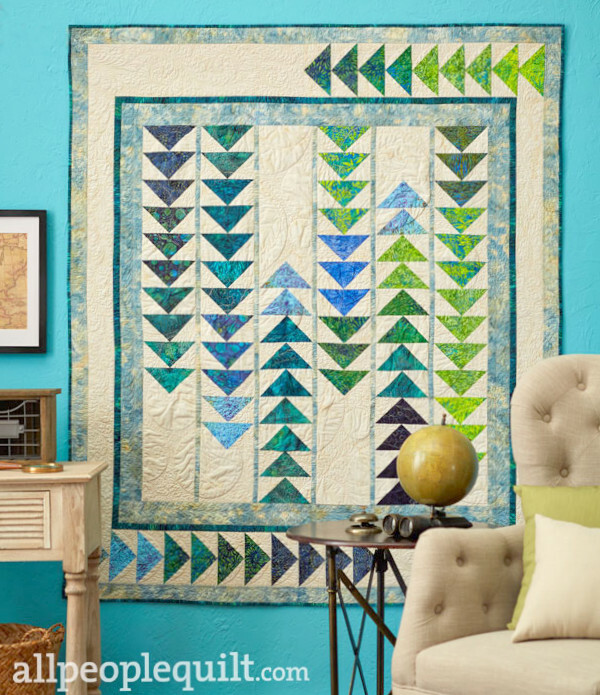 Migration is beautiful in every detail: from you use of subtly changing color to you gorgeous quilting! A huge Congratulations! Can’t wait to see what your next project is! Yet another beautiful quilt Wendy. Love the layout and the colors are just beautiful too! Isn’t that Aurifil 50wt amazing thread? Thanks for your inspiration!